Do you have an opinion of the Patagonia Stealth Hip Pack or have them in stock? I’ve been fishing a Fishpond chest pack for a few years now and while fishing the North Brach this week I thought how nice it would be to keep the weight off my back. Also I fished in the rain for a few hours on Sunday and the chest pack, along with my gear inside got soaked. The DWR treatment on Patagonia’s hip pack sounds like a nice feature if it keeps the elements out.The fishing was pretty slow but I did mange this rainbow. Oh and I got to break in my Backwater Angler hat! This entry was posted in fishing report, gear on September 29, 2013 by Theaux Le Gardeur. Thanks to Max for the nice shots of a trico in a web and this beautiful native Brookie from the Masemore Rd access. The Gunpowder is flowing at 31 CFS is low, clear and swinging from 50 to 53F. 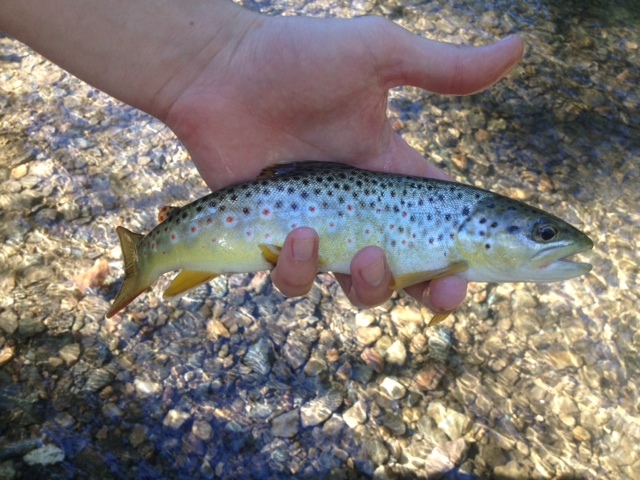 No shortage of small flies and rising fish are showing along the catch and release area. Tricos have been late. As the water warms up, spend some extra time adding some 7x. 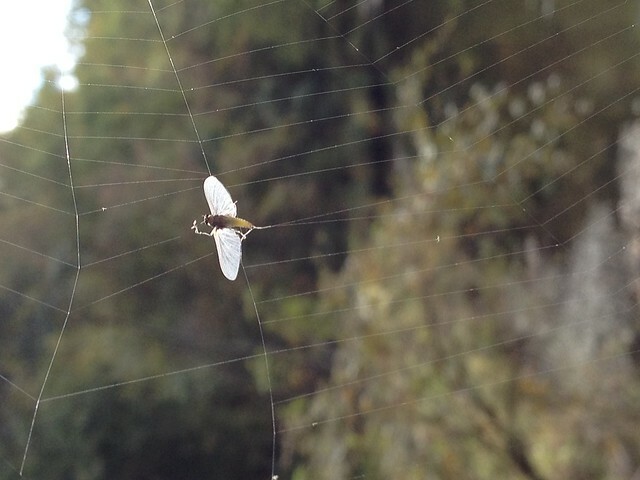 It’s tough to see those tiny flies even on a short cast, so consider tying the flies onto a fly you can readily see. Elk hair caddis in a #14-16 or a foam ant in a #12-14 are good point flies. At times, especially during cloudy warm mornings, a few Blue Winged Olives in the #18-20 range are a good bet. Unweighted streamers like Grey Ghosts and Mickey Finns are worth a shot in the shallow flats–especially along log jams and woody debris. This entry was posted in fishing report on September 27, 2013 by Theaux Le Gardeur. With the recent drop in air temperature it seems that fall has graced us with her presence. 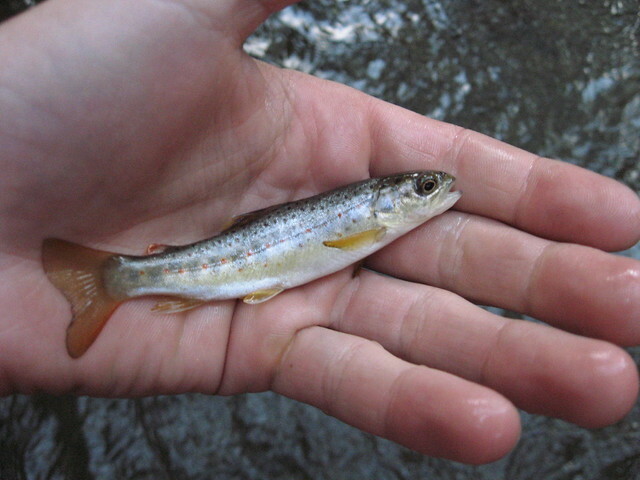 The stream is still quite low at 31 cfs so expect to find fish in areas with access to deeper water, cover, and shade. 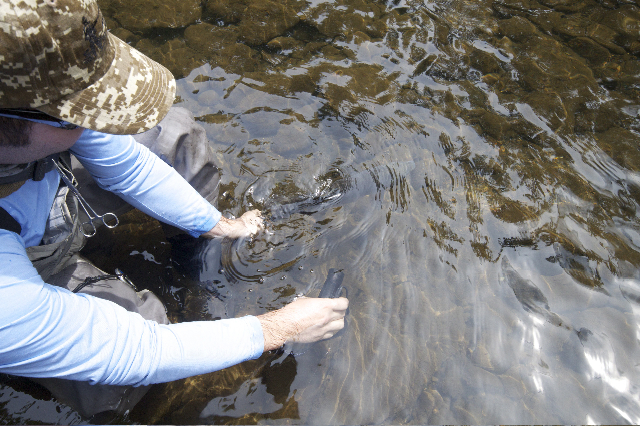 Now is a good time to fish the pools, tailouts and deeper riffles above Falls Road. Water temps are in the mid 50’s by noon so the fish are in good shape, active and a little skittish. Keep your false casting to a minimum and use the longest leaders you can turnover comfortably. Caddis and small terrestrials are still moving fish. If you are more inclined to fish in the morning, standard Gunpowder nymph rigs like pheasant tails, caddis pupa, and zebra midges are worth a shot. 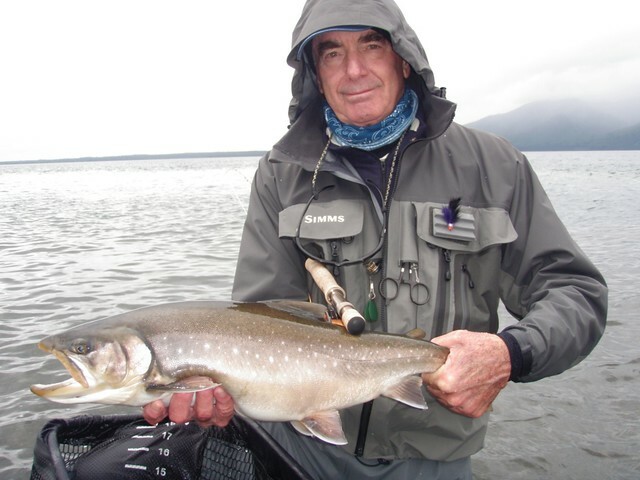 This entry was posted in fishing report on September 13, 2013 by Theaux Le Gardeur. Please join us for a fly fishing school. 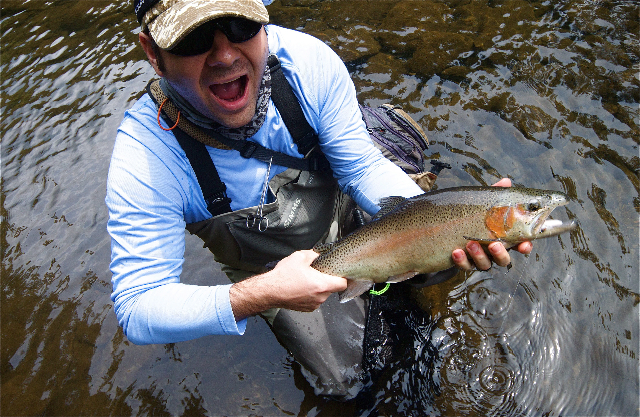 On Sunday, September 15th, a Backwater Angler Guide will be teaching a fly fishing school that is ideal for beginners. If you’re planning on flyfishing Maryland, or anywhere else for that matter, this course is a great introduction to the sport. The school covers knots, casting, gear and fly selection. Class is held from 11:00 AM till 2:00 PM. Cost is $125 per person and includes the use of gear. A Maryland non-tidal fishing license and trout stamp is required and may be purchased at the shop with check or cash the day of the school. Class size is limited to 4 and pre-registration is required. Please give us a call at 410-357-9557 to pre-register. This entry was posted in events on September 13, 2013 by Theaux Le Gardeur. Thanks to Neil for the report and picture from Alaska. Fishing was tough in Alaska with seven days of rain/wind, 24/7. Streamers, streamers and more ugly streamers…didn’t have a dry piece of clothing after day three. –Best char was on the purple leech. 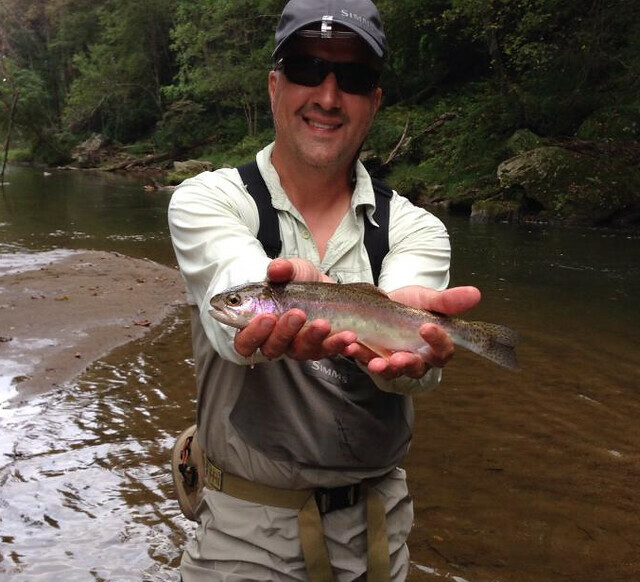 This entry was posted in fishing report on September 7, 2013 by Theaux Le Gardeur. The Gunpowder is flowing at 29 CFs is clear and warming up. Water temps have risen in the past week from a high each day of 52 F to temps approaching 58 F. Fish have been looking up after 11 AM and are taking tricos, small caddis and terrestrials. Flying ants and small beetles are also worth a shot. Wet wading is certainly possible as the river has plenty of exposed gravel bars at these flows. Small dries in the #18-22 range fished with a long (10-12ft) and fine (6-7x) leader have been accounting for lots of wild fish in the flatwater. As Josh’s recent stream report indicates, with the recent drop in streamflows, you’ll find plenty of Young Of the Year (YOY) pushed into the open and in the sights of larger browns. The past couple weeks I have been hearing accounts of people coming in and explaining they are catching tiny fish with no true explanation.The reason is the young of the year are getting to the size where they have started to move into the main-stem of the Gunpowder. Bigger fish take advantage of this and prey on these fish. I prefer to try to fish a streamer that has great movement under the water. 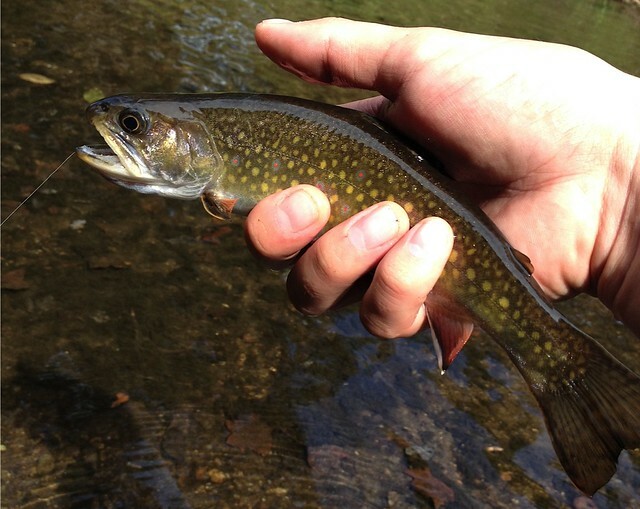 Rabbit strip zonkers move like a baby fish and will only help your odds of tricking a big fish on the Gunpowder River. Please note: Shop hours on Labor Day will be 10AM till 2PM. 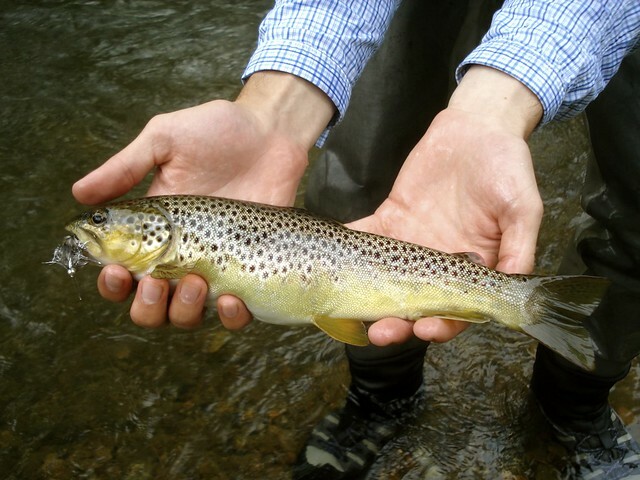 This entry was posted in fishing report on September 1, 2013 by Theaux Le Gardeur.